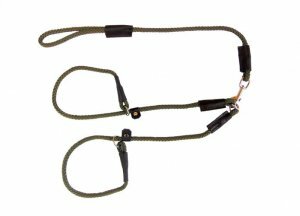 From the UK, these deluxe leather-fitting slip leads are designed for people with two dogs and are a well-made multi-plaited polyester Training/Walking Slip Lead. Ideal for the handler who have two dogs. A metal swivel, where the lead splits in two, helps to avoid tangling. Additional add-on collar sections are available if you have more than 2 dogs. Here's the link.